Scoring an impressive series of victories for different clients, including a legal "hat trick" for a trifecta of wins for one client and making legal history for another client by winning the first ever award in a particular type of labor arbitration, Bonnie Mayfield has earned her designation as a seasoned and business savvy trial and appellate lawyer. She also has received client recognition for building a diverse and inclusive team. 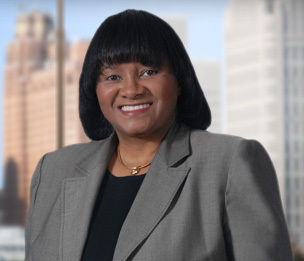 As a member of the Litigation and Labor & Employment Law practice groups, Ms. Mayfield has successfully litigated employment discrimination, labor, hybrid §301, retaliation, wage and hour, whistleblower, tort, product liability (automotive, pharmaceutical, medical device, chemical and toxic tort), and commercial matters. She regularly advises and counsels clients about administrative, internal and labor matters. Ms. Mayfield’s skills in settling matters also have resulted in her being brought in as a settlement strategist, ensuring a successful, effective and “win-win” resolution. As the designated emergency responder for a petroleum manufacturer, Ms. Mayfield is available on a 24/7 basis for emergent services in the State of Michigan. Ms. Mayfield has tried product liability, pharmaceutical, commercial, medical malpractice, labor and employment cases. She also has been selected by several major clients to defend their labor, employment, pharmaceutical and commercial matters and also to be the Responsible Partner managing the client/law firm relationships. As a Responsible Partner, Bonnie assists in the management of the client/law firm relationships and also performs substantive work for those clients. She enhances the client/law firm relationships, facilitates constructive feedback and provides a common focal point and conduit for both our lawyers and client contacts, in addition to defending legal matters. A frequent lecturer, she has spoken to groups such as the International Association of Defense Counsel (IADC), and the State Bars of Michigan and Wisconsin, and was a panelist at the American Bar Association's mid-year products liability meetings. Prior to joining Dykema, she served as a Council on Legal Education Opportunity teaching assistant for Ralph Smith (former law professor, University of Pennsylvania) and clerked for the NAACP Legal Defense and Education Fund. She also clerked for the Honorable Julian Cook (former Chief Judge of the U.S. District Court, Eastern District of Michigan) and for the Honorable Nathaniel R. Jones (former Circuit Judge for the U.S. Court of Appeals for the 6th Circuit). Ms. Mayfield interned for the Honorable Harold Baer, Jr. (former New York Supreme Court Justice) and the Honorable Caleb Wright, Jr. (former Delaware Federal District Court Judge). In law school, she was a member of New York University's Law Review. "Hope Is Not Lost for Defending Mich. Whistleblower Claims"
"Preventing Manufacturer Compelled Disclosure of Confidential Information Contained in Voluntarily Submitted Adverse Event Reports"
"Prima Facie Design Defect Case & Expert Testimony"
"Batson and Groups Other than Blacks: A Strict Scrutiny Analysis"
"Rainmaking: Business Development And Retention Techniques"
The “n”-Word: (N)Ever Contextually Appropriate, In The Workplace?